Scientists are interested in finding out about hair, wool, nails and skin for several reasons. Pharmaceutical companies are looking into possible treatments for a variety of very common skin complaints. 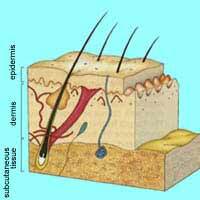 Eczema, psoriasis, acne and dermatitis are all examples of these. Cosmetics companies are trying to develop new products to improve the appearance of hair, nails and skin. Textile manufacturers use wool as one of their raw materials, so it is important that they know about its chemical and physical properties. What do these four materials have in common? Hair and wool are very similar but both are quite different from nails and skin. They all, however, are protein-based structural materials and they all have a particular protein, a-keratin, as one of their components. You can stretch hair to at least twice its original length before it breaks (see Basic experiment 2b). It can be made to curl permanently or set temporarily. We can explain the way it behaves by looking in more detail at the molecules it contains. The a-helix molecules in hair are bundled together in a regular way to give protofibrils, microfibrils and macrofibrils. Each hair is wrapped in a cuticle made up of protein scales (Figures 10a and b) and contains macrofibrils embedded in matrix proteins. If you heat hair, particularly with steam, and then pull it, the relatively weak hydrogen bonds in the a-helices are stretched and broken. This allows the molecules to elongate without breaking. As the hair continues to stretch, the helix structure breaks down and is replaced by b-pleated sheet. At this point the hair is far less stretchy as the hydrogen bonds now run at right angles to the length. The only way the molecules can elongate in this state is by bending and stretching the covalent bonds of the polypeptide chain. The matrix proteins also change as the hair is stretched. These proteins are tangled up and have many disulphide cross-links . Stretching deforms the matrix and these cross-links help the hair recover its original length when the pulling force is removed. If you apply moist heat the hydrogen bonds will break. In a process called styling you can change the shape of the hair and allow it to set by reducing the temperature and humidity. New hydrogen bonds form to keep the hair in its new style. You can read about perming hair in Section 3.7. 1. Explain why heat and moisture help to break the hydrogen bonds in hair. 2. Would the styling be long-lasting or temporary? Explain your answer.